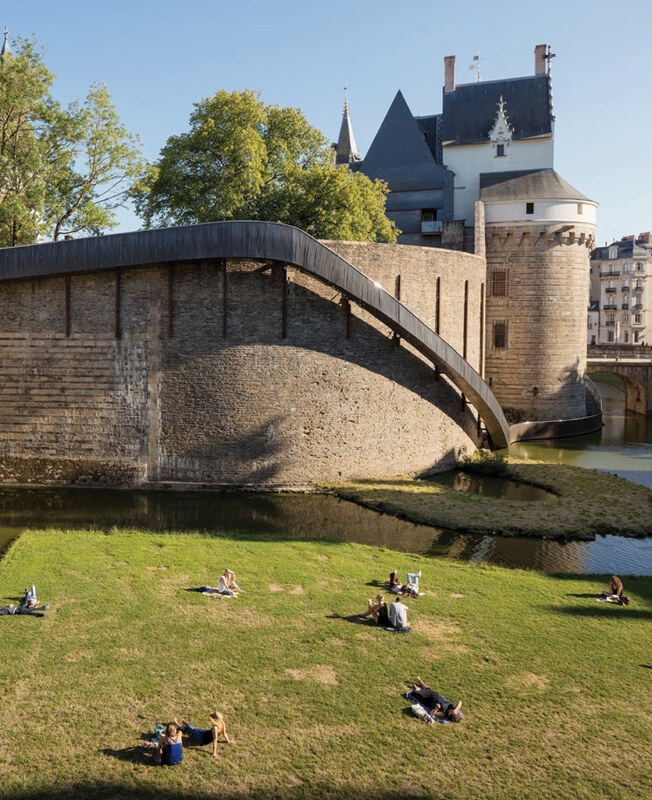 Straddling the river in the Pays de la Loire region near the western coast of France, Nantes — the sixth biggest city in the country — is well regarded as a dynamic, cultural destination, with its annual arts festival colonising every corner of the city with art each year. Yet for six years as the streets and boulevards welcomed installations, exhibitions and interventions with open arms, the city’s own Palais de Beaux-Arts remained a closed-off edifice, its monumental, neoclassical building protected from its surroundings by a barricade of ornate, iron gates. Sandwiched between the cathedral, the towering chateau of the Dukes of Brittany and the botanical gardens, on a square plot in a quiet residential area near the old centre, the out-dated museum was in danger of being forgotten, as Nantes’ cultural axis — the Green Line, a trail painted on the pavements to guide visitors around the city’s best cultural stops — skirted the museum, directing itself towards the cultural transformations of the industrial Île de Nantes across the water. 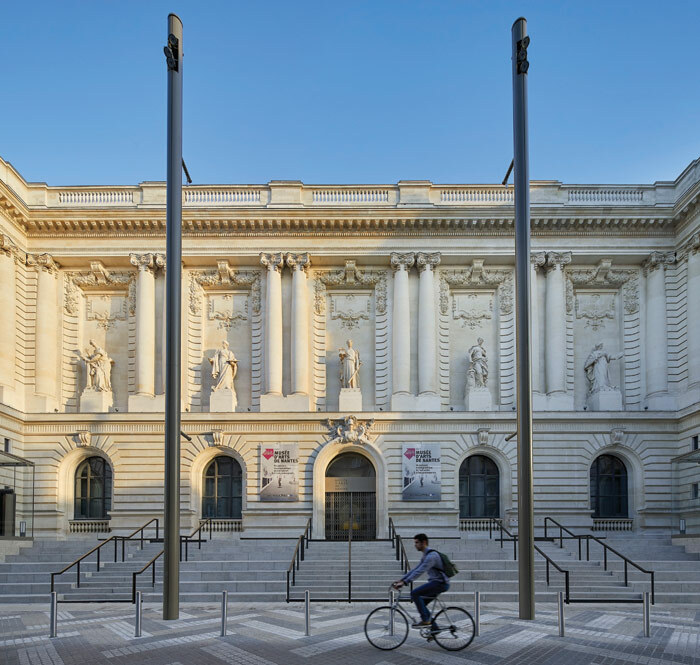 But the Palais has now reopened as the new Musée d’arts de Nantes following a €48.8m transformation by London-based practice Stanton Williams that attempts to open the museum up to the city. The Palais, built in 1801, once presented an elitist frontage, elevated on a plinth and largely windowless, with an elaborate facade of composite columns framing deific statues that appear to look down at gallery visitors with quiet authority. A narrow staircase behind the gates from Rue Clemenceau led up to the main entrance and the whole building had become dirty with age. The stone has since been cleaned up and the building now appears less oppressive with a light, golden glow. Stanton Williams’ first gesture was to strip back the barriers and steps to embrace the street and make the museum more accessible. The gates have been replaced by broader steps that offer a route into the building as well as a space to sit and gather. Two minimal glass boxes book-end the space; one contains a lift to the museum, while the other has been conceived much like Trafalgar Square’s Fourth Plinth and will host contemporary art installations. A chevron motif on the pavement floor, based on the gallery’s original parquet, extends out into the street, which will eventually be pedestrianised. Stanton Williams calls this space a ‘courtyard’ or ‘parvis’ and, although not quite either, it is hoped that this thoroughfare will be commandeered by the public and host street entertainment and events. ‘We thought about how we could get the content on to the street and take the gallery outside. We can’t change the fact that the museum is 3m above street level but we can make that movement much more seamless. I’m not sure people will notice, but it’s our way of saying you’re standing on a public space that could be an art space,’ says Richard. The extension, or Cube, is connected to the Palais by a suspended walkway punched into the old building’s western side that cantilevers over the Cours Jules-Dupré, a pedestrian route that links the heart of the complex back to the main street, Rue Clemenceau. The monolithic Cube, largely hidden and shoehorned into a tight site in the city block next to the Palais where a garage used to be, can be glimpsed through this street opening, and also from the extension’s rear side on Rue Gambetta, where large, glazed slots offer views into the contemporary gallery spaces. 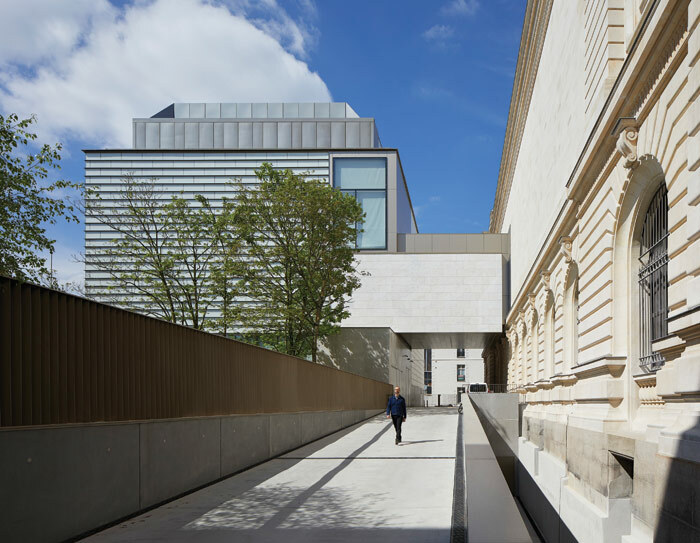 From the Cube, visitors can then reach the chapel, which will host temporary installations, and a long, thin, sculpture court linking to a new, similarly monolithic, archive building that has been squeezed between two existing residential buildings a few doors down from the Palais’ entrance. Inside, the existing spaces of the Palais have been reorganised and together with the extension, exhibition space has been increased by 30% with 900 works on display. 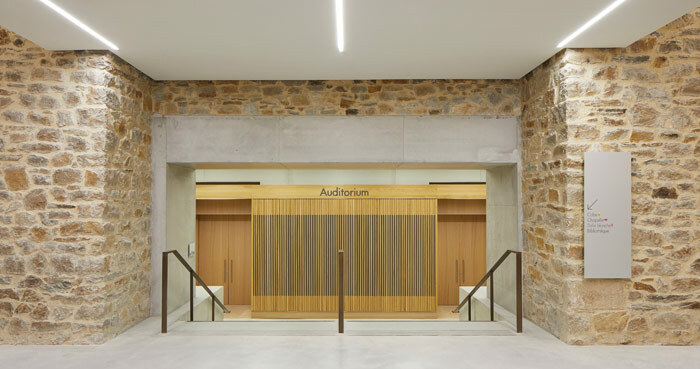 As well as acting as architects on the project, Stanton Williams also conceived everything from the museum layout and landscaping to its graphic identity and signage, a first for the practice. ‘The responsibility we’ve been given is absolutely unheard of, I think; it’s unusual that everything has been conceived together. We’ve worked on exhibitions, we’ve worked on museums, we’ve been very much involved but not always under the same project,’ admits Richard. The exhibition route has been carefully curated by Stanton Williams to create a coherent path that takes visitors on a loop from the Palais through the Cube to the chapel and then back again via the basement. 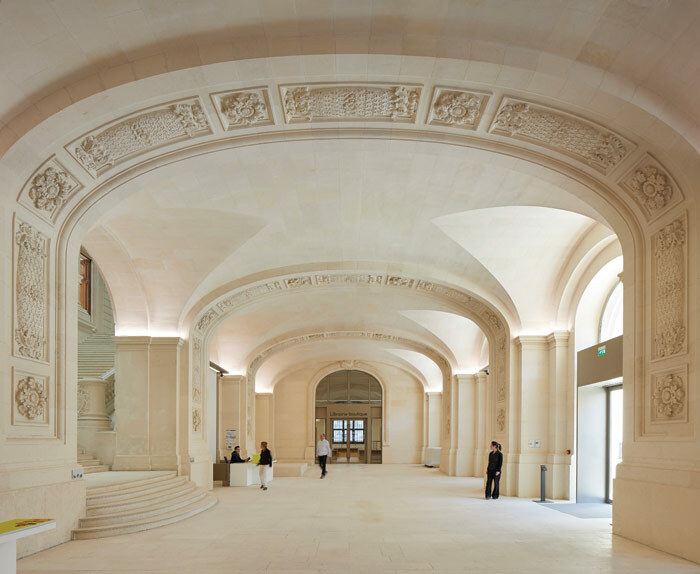 Previously, the ground floor was largely taken over by a library; now as they enter the narrow, vaulted lobby of the Palais, visitors are greeted by a Michelin-starred cafe in the left-hand corner and a shop at the opposite end. The original grand, double staircase, restored and beautifully clean, sweeps visitors up to the first floor or they can start the route in the ground-floor galleries to the right of it. Ground-floor windows have been reopened to the outside and the long, linear sequence of galleries, traditionally designed for salon-type art shows with pieces in repetitive rows, has been reorientated with the use of angular display blocks and partitions that can be dismantled and reconfigured depending on the museum’s needs. Some are cleverly coloured to tie in with the time period of the art on display: Wedgwood blue for the 18th century, deep red for the Oriental galleries, for instance. The centrepiece of the museum is the Patio, the central courtyard around which the galleries of the Palais are arranged. Historically it was used to display classical sculptures and more recently art installations by contemporary artists such as Anish Kapoor. 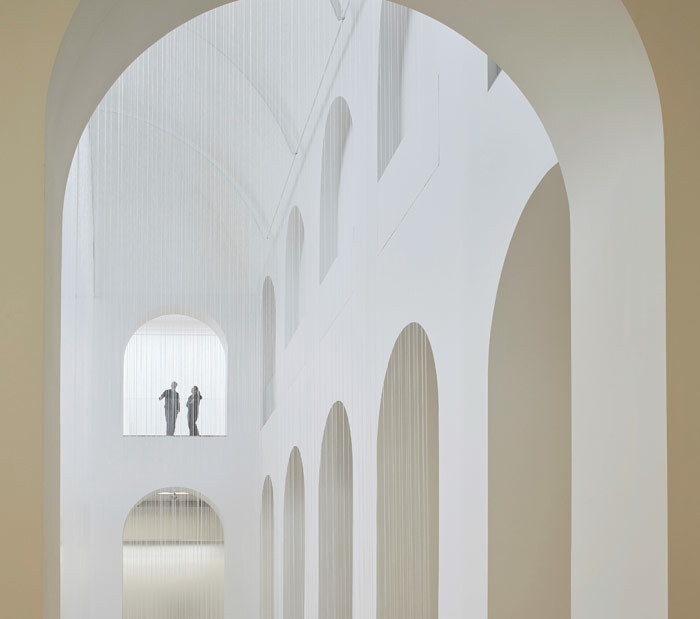 Some of the original architectural details had been lost over the years but Stanton Williams has re-choreographed the arched openings, moving some and blocking others entirely, to create a clean, reduced, pure-white version of the original space. It can even be closed off completely. Says Richard: ‘I call it the cubical moment, because it has got a very cubical, abstract classicism in some ways.’ In June, the Patio reopened with an ethereal work by Austrian artist Susanna Fritscher titled Nothing but Air, Light and Time, filling the space with hundreds of delicate, transparent, silicone threads that vibrate and catch the light as it falls through the glass roof. 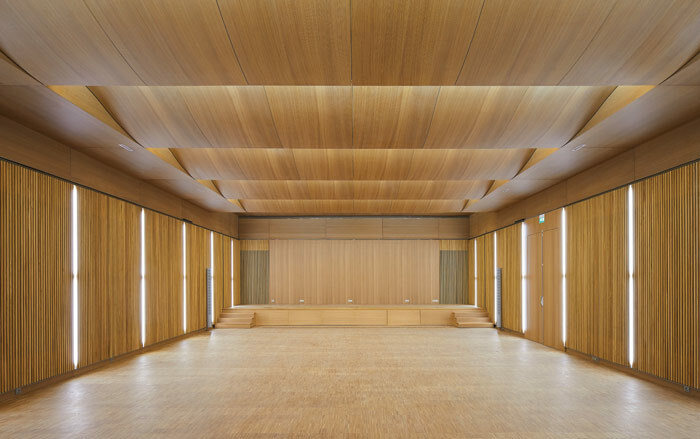 Natural light is an integral element in the transformation of the spaces. 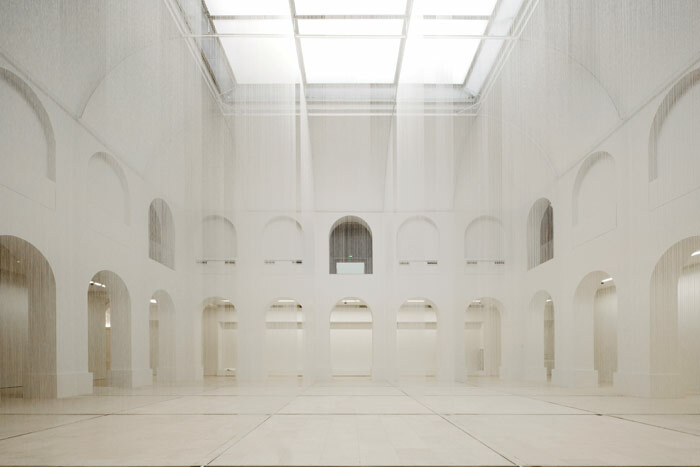 The old, leaky glass roof of the Patio and galleries, which shone too much light in the south galleries and too little in the north-facing spaces, has been replaced by a four-layered system of glass, stretched fabric and adjustable blinds. It allows for subtle variations in light throughout the day in a much more nuanced approach than artificial lighting. 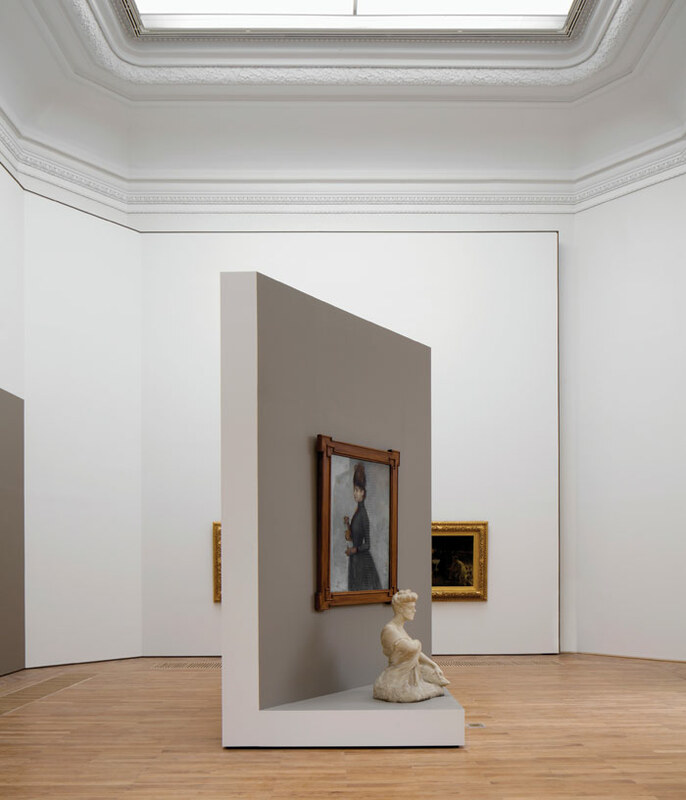 Elsewhere, Stanton Williams worked with Max Fordham to design bespoke light fittings, such as the scallop-shaped wall washers carved into the plaster in the Palais. 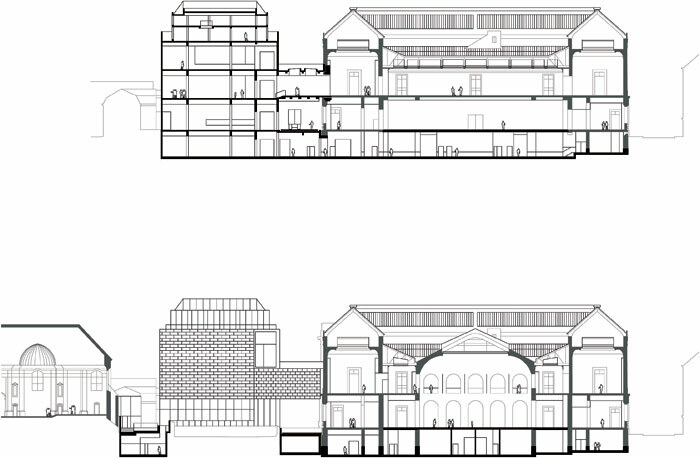 In order to be able to fit in the extra spaces needed for the expanding museum — a flexible, new auditorium for events and concerts, education spaces, storerooms and restoration workshops — the Patio first had to be excavated by 6m and underpinned to squeeze in a basement that spans the entire plan of the Palais. ‘We needed to find the space in a very constrained city site. Everything is very much shoehorned in, we really used every square inch available,’ says Richard. 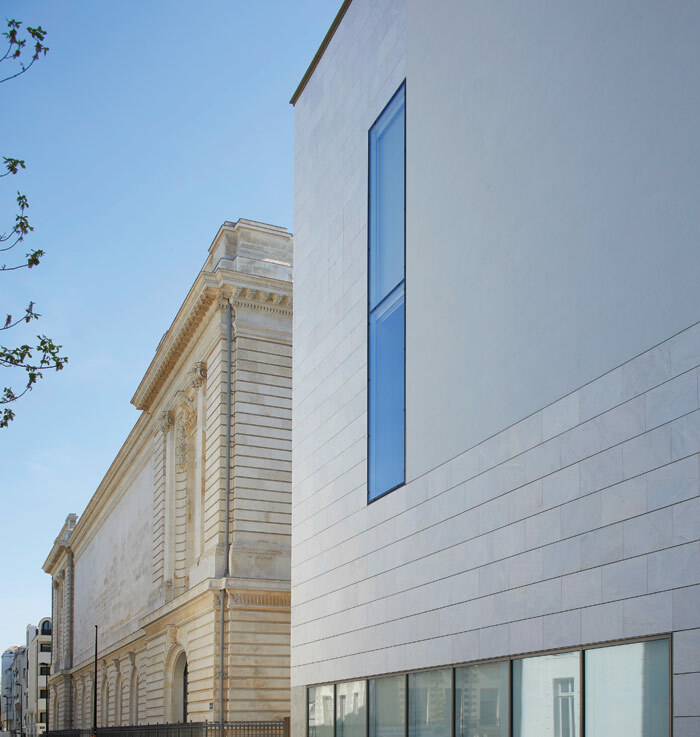 From the exterior, the Cube appears as an abstract, solid, white box, its light marble cladding and stone-effect render referencing the traditional, chalky Tuffeau limestone used for the rear wall of the chapel and nearby cathedral, as well as chateaux all along the Loire valley. 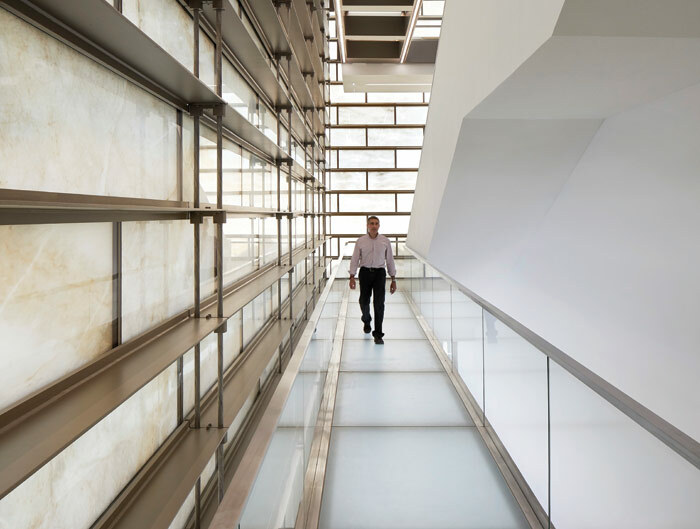 It is largely a plain building, bar the translucent, suspended curtain wall on the south side that is made of thin, lightly veined panels of marble and laminated glass, filtering light into the Cube’s circulation route and staircase, and giving the monolithic block a soft glow at night. ‘During the day it is very white and solid, but because it’s south facing, the facade becomes almost ornamental, you can see all the veins of the marble. For me it has something of a 19th-century painting, like a Monet. You have the great staircase in the Palais with a fresco and a bas-relief on one side. Our staircase, although very contemporary, you could say the marble facade is also a big fresco,’ explains Richard. The whole transformation by Stanton Williams is deftly done, with a light, subtle touch. 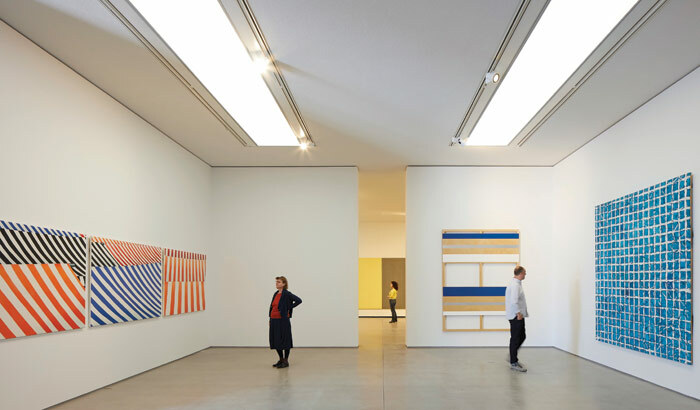 One would never know, for example, that there were three shades of white used in the gallery spaces, becoming gradually lighter and purer in tone as one goes up the building. This is a respectful restoration, with the extension playing a supporting role, so that the original Palais can shine again and embrace the city around it. 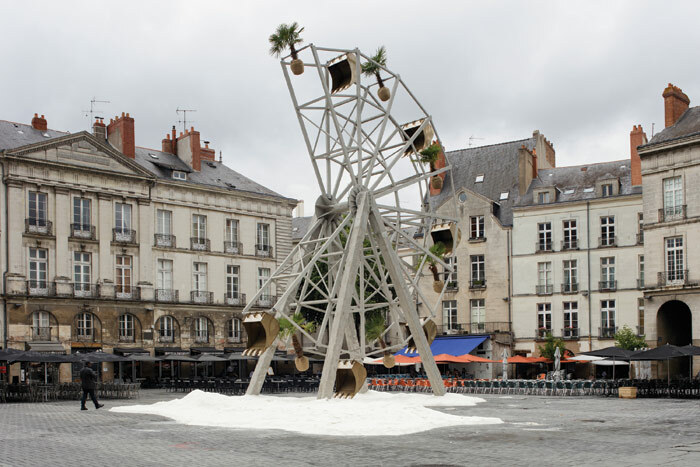 For two months each summer, the old town squares, narrow alleyways, industrial warehouses and waterways of the French city of Nantes become playgrounds for artwork and installations, all free for the public to enjoy. 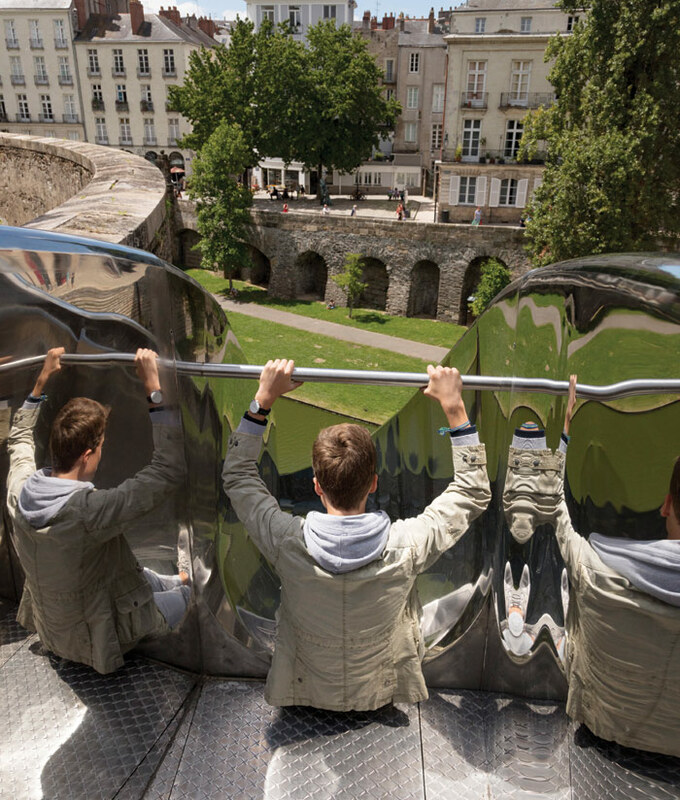 Now in its sixth edition, the publicly funded arts festival Le Voyage à Nantes combines more than 50 weird and wonderful works clustered along a 12km-long cultural trail snaking through the city. Past highlights have ranged from a pop-up, open-air canteen and a picnic area in the docklands, through a whimsical, moon shaped playground with trampolines for craters, to a surreal series of ping-pong tables and a distorted football pitch. ‘The idea of the festival is to colonise every part of the town with artistic creation,’ says artistic director Jean Blaise. Empty spaces, abandoned buildings and formerly derelict pockets of land come alive to art trails, market gardens, community events and street art in a playful city that embraces culture as its life and breath. The city wasn’t always so forward thinking and fun — it’s taken almost 30 years to transform the image of Nantes from run-down, provincial city to vibrant, cultural destination. In the Eighties Nantes was known as ‘une belle endormie’ or Sleeping Beauty — its naval shipyards had closed in 1987, the city suffered economically and there was widespread unemployment. The Île de Nantes — the only island left after channels of the Loire were filled in to make way for cleaner thoroughfares and boulevards during the early 20th century — was disconnected from the city centre and lay forgotten, its abandoned, ship-building warehouses ripe for transformation. In 1989 in came Jean-Marc Ayrault, a young, new mayor with a vision to tie the city together and inject back some life. Together with Jean Blaise he founded the Nantes Research Centre for Cultural Development, initiating an ambitious cultural regeneration programme that would revamp the image of Nantes from drab to dynamic. Pre-dating the meanwhile projects and pop-ups that proliferated worldwide across cities following the financial crisis more than a decade later, the city used temporary solutions and quirky installations to quickly bring energy and test the ground for future, longer-term developments. It all started with Les Allumées festival (1990–95). For six days each year, from 6pm to 6am, empty plots of land across the city came alive with shows and performances by foreign artists invited from other port towns, from Barcelona and Buenos Aires to Cairo and Havana. Slowly Nantes started to wake up again. One of the locations to be taken over by the artists was the derelict, old LU biscuit factory on Quai Ferdinand-Favre to the east of the historic centre, abandoned after LU moved its production out of the city in 1986. Transformed by French architect Patrick Bouchain and reopened in 2000, it became le lieu unique, a cultural hub combining exhibition spaces, auditorium and concert hall, artist studios, rehearsal rooms, bookshop and a restaurant spilling out on to the canal-side. 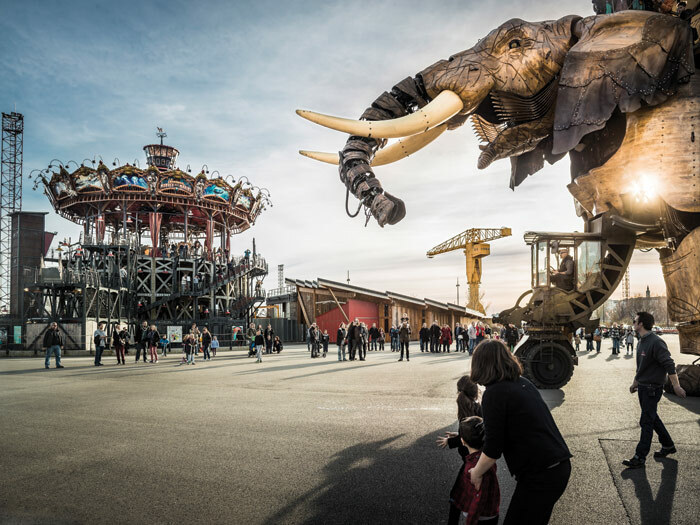 2007 was another key year for Nantes — the castle of the Dukes of Brittany reopened and the bizarre world of the Machines de l’île were born, giving the city its famous, giant, mechanical elephant that parades around the former shipyards on the Île de Nantes. The impossible-to-miss structure, designed to carry 50 people on its back for 30-minute rides as it sprays water out of its trunk, is 12m tall and took 150 people some 30 months to make. Each ear is formed of the leather of five cows. A merry-go-round of mythical sea creatures was added in 2012 and a monumental, 35m-tall heron tree on the opposite riverbank, crowned by two mechanical herons that will have 15m wing spans and hold 45 people each, is planned for 2021. At the same time, Blaise curated the arts festival Estuaire Nantes <> Saint Nazaire (2007/2009/2012), linking the two Brittany cities with a 60km-long trail of art and sculpture along the estuary of the Loire. The first edition in 2007 repurposed the port-side warehouse, Hangar à Bananes, on the western tip of the Île de Nantes into an exhibition space with 8,000 sq m of restaurants and bars, a theatre and gallery for contemporary art, much like le lieu unique but on a bigger scale. 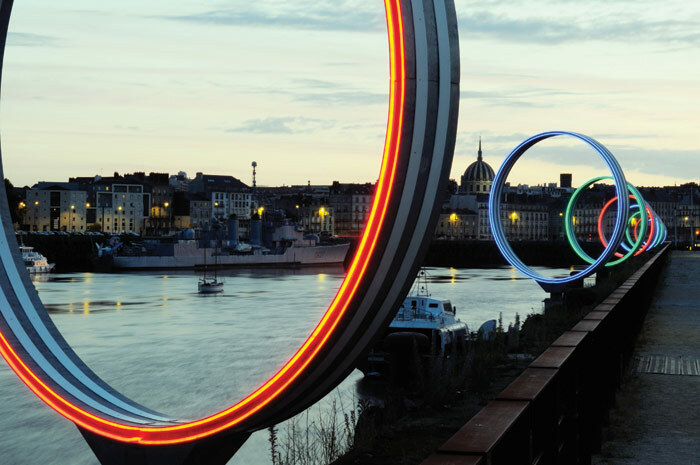 Now, 30 installations from the three events remain along the route, including Daniel Buren’s Les Anneaux that frames the vista of the historic centre of Nantes from the island with a series of rings that light up at night. The city wanted to change the axis of Nantes towards the Île de Nantes and reconnect people to the island. 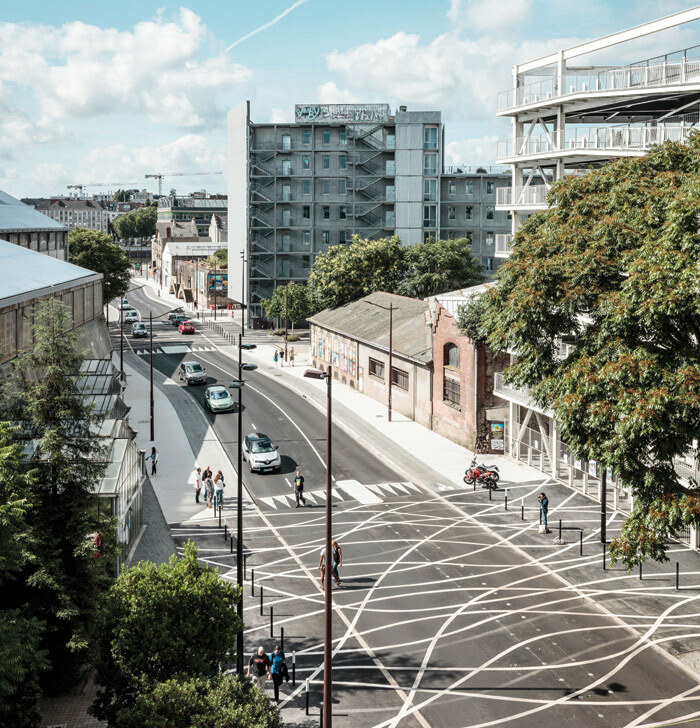 Led by the Samoa (Société d’aménagement de la métropole ouest atlantique), some 337ha on the isle’s western side were earmarked for a potential new city centre, with renowned architects and urban planners such as Jean Nouvel, Alexandre Chemetoff and Christian de Portzamparc brought in to transform rather than demolish the area’s industrial heritage. It’s a project on a mammoth scale. By 2030, the aim is that there will be 6,000 new apartments and 70ha of redeveloped public space. A new 270,000 sq m hospital is also planned as well as a 14ha park to the south-west. A key gesture was moving the Palais de Justice into an imposing, new black building designed by Nouvel overlooking the water directly across from the old city centre (2000). 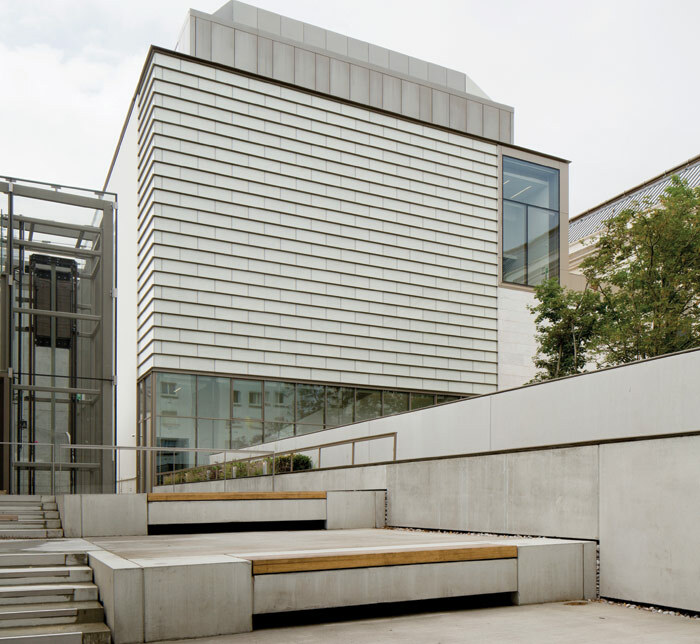 In 2009, the Nantes School of Architecture also relocated to a 15,000 sq m concrete building by Lacaton & Vassal, where external, car park-like ramps connect three, double-height volumes with views over a new Creation Quarter clustered behind the Palais de Justice. Here, five buildings of the former Alstom warehouses, totalling 25,000 sq m, are being overhauled by Franklin Azzi Architecture to house the École des Beaux-Arts for the start of the school year in September. The original steel structure with its zig-zag-shaped roof has been retained and wrapped in transparent plastic sheeting. With these serious, large-scale developments, Nantes could easily have lost some of the joie de vivre that defined those first experimental projects. Le Voyage à Nantes does the job of shaking things up each year. This year, 30 artists were invited and given free rein to create what they liked. Three of the city’s public squares were taken over by artists exploring the darker side of society, with themes of anxiety, abandon and dereliction. 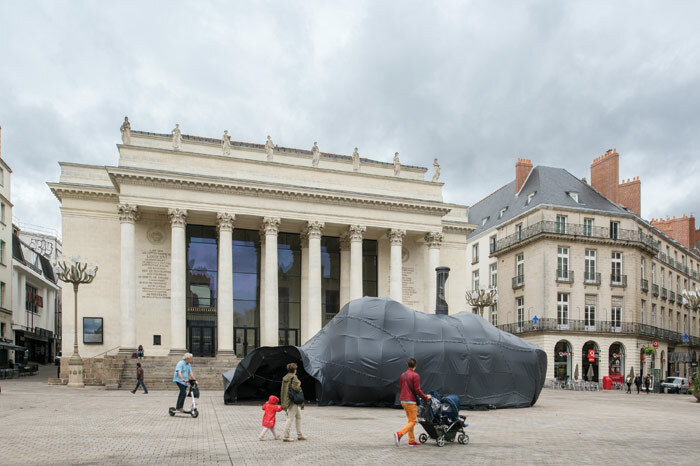 Roboticist and artist Nicolas Darrot installed a mysterious, giant, sleeping figure that appeared like a big, black blob in front of the grand columns of the Opera House in Place Graslin, while Boris Chouvellon created an eerie ferris wheel envisioned as a modern ruin that could not turn in Place du Bouffay. 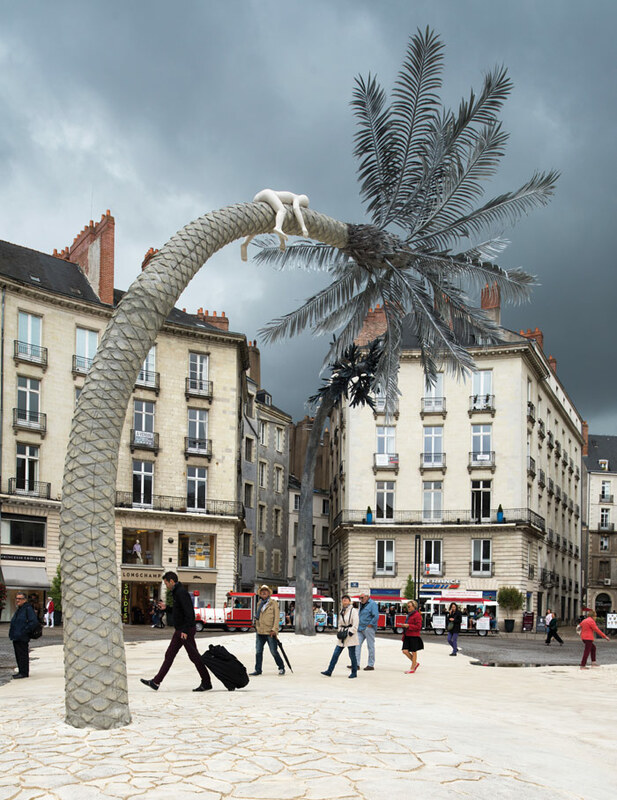 In the third square, a surreal landscape of palm trees by Laurent Pernot made an appearance, their trunks weighed down by the weight of three naked, white figures. Positioned next to a fountain, its dried, cracked, white soil pictured a fragile future haunted by global warming. Elsewhere, Myrtille Drouet built a compact, 26 sq m, experimental home between two buildings in the heart of the historic city centre. Just 2.78m wide and perched 5m above ground, Micr’Home comprises a living room/kitchen, bathroom and bedroom arranged around a lightweight metal staircase. 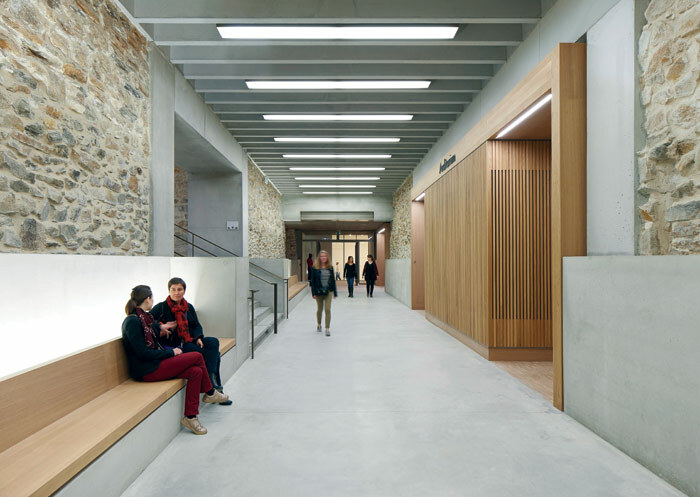 Visitors could also take in Susanna Fritscher’s installation at the new Musee d’arts de Nantes, a set of new wood and stone works by sculptors Daniel Dewar and Grégory Gicquel at HAB Galerie and outside in the setting of Cours Cambronne. Culture has put Nantes on the map. Tourism has grown by almost 40% over the past five years of the festival — this year it’s estimated two million people came to the city for the event. Le Voyage à Nantes costs €2.7m to put together, but since it was initiated in 2011 it has also brought €50m back into the city’s economy. 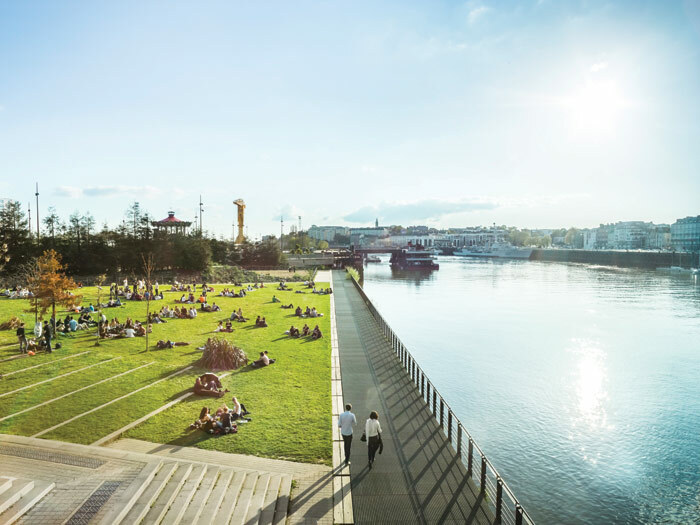 But Nantes’ cultural regeneration has brought so much more than art-loving visitors: in 2013, it became the first French city to be awarded the title of European Green Capital — it has 57 sq m of green space per inhabitant. It ranks first for digital jobs’ growth in France and second for the place where French people would most like to work, with 60% of its population aged under 40. The case of Nantes shows that by using a bit of imagination, opening up possibilities and injecting some joy, culture can create a playful, happy, thriving city that connects with its people.